If you use Internet Explorer, switch to Chrome. If you insist, you can download the Alexa Toolbar. 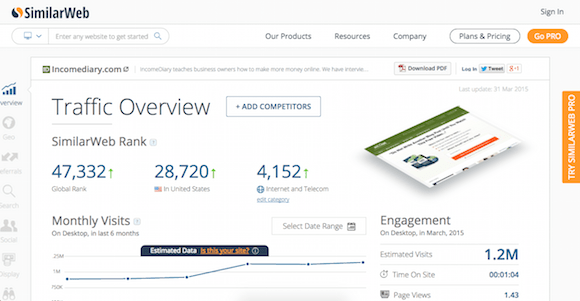 Compete.com is like Alexa, except they pull their stats from multiple sources and it’s only based on U.S. traffic. Based on checking my sites and Income Diary, the “Unique Visitors” stat that it generates is much lower than the actual traffic. SimilarWeb is another website traffic checker that’s similar to Alexa and Compete, except, it’s got a lot more detail put into it, so it’s more accurate! 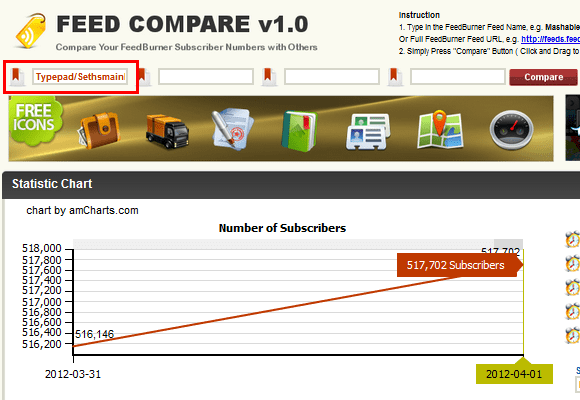 Feed Compare is a neat tool that lets you see how many RSS subscribers a website has as long as they use FeedBurner. Most sites should link directly to their RSS feed on FeedBurner. Look for the orange icon. Step 2: Put the FeedBurner ID i­nto Feed Compare’s tool. As you can see, Seth Godin has over 500,000 subscribers and it grew 1,500 in one day. 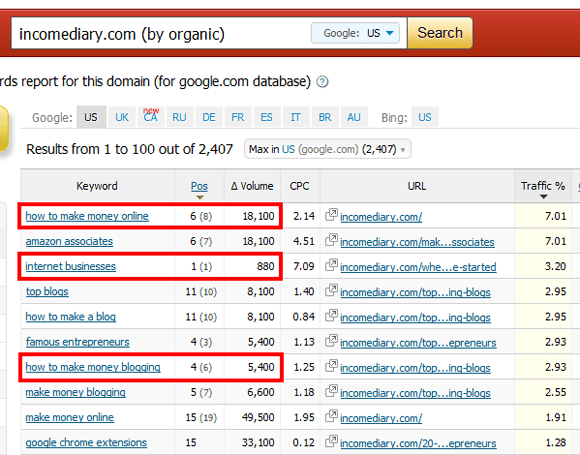 As you see, Michael ranks 1st for “internet businesses,” 4th for “how to make money blogging,” and 6th for “how to make money online.” Those are highly competitive keywords that are collectively searched over 20,000 times per month. 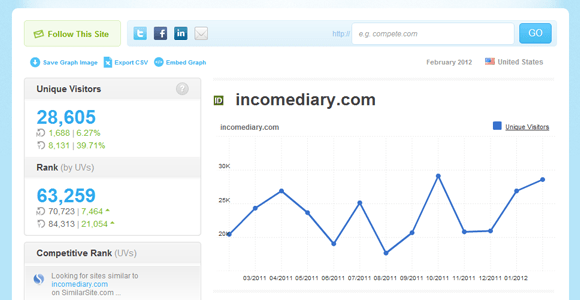 The second half of the URL tells you that you left the 108,656th comment on IncomeDiary.com. This number includes spam comments. Assume that 75-90% of the comments are spam and you can get an idea of how many comments a site has had since day one. In the beginning, lots of bloggers share all of their stats about how much traffic their site is getting and where this traffic is coming from. As the blog grows, this information becomes more and more valuable so most bloggers stop sharing it. If you peruse through the archived articles on a blog, there’s a good chance you’ll stumble upon a “blog in review” or “traffic report” post. With those stats, you can start to figure out how much traffic the site is getting today. A few sites, like ThinkTraffic.net, choose to publish traffic reports every month because those stats are very relevant to their audiences. Admiring the commitment you put into your blog and in depth information you offer. It’s great to come across a blog every once in a while that isn’t the same outdated rehashed information. Wonderful read! I’ve saved your site and I’m adding your RSS feeds to my Google account. I have been exploring for a bit for any high quality articles or blog posts in this kind of house . Exploring in Yahoo I at last stumbled upon this web site. Studying this information So i am happy to convey that I have a very good uncanny feeling I found out just what I needed. I so much without a doubt will make certain to do not forget this website and provides it a look on a continuing basis. Its really a great and useful piece of info. Im satisfied that you just shared this useful info with us. Please stay us informed like this. Thanks for sharing.